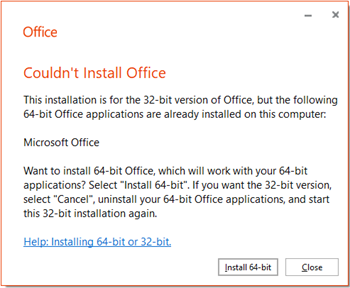 If you tried to install a 64-bit or 32-bit version of the Office suite, or an Office standalone application such as Visio on a computer that already has either the 32-bit or 64-bit version of Office, you could see an error message similar to the one below. This occurs because you can't mix 64-bit and 32-bit versions of Office. To fix this error and switch from 32-bit to 64-bit (or vice-versa), you must do the following in this order. Go to Uninstall Office from a PC and follow the steps to uninstall the version of Office (or stand-alone Office application, such as Visio or Project) you don't want. Select your version below and follow the installation steps. For overall guidance about which version to install, see Choose the 32-bit or 64-bit version of Office. If you're not sure which bit version you may have already installed, see What version of Office am I using?